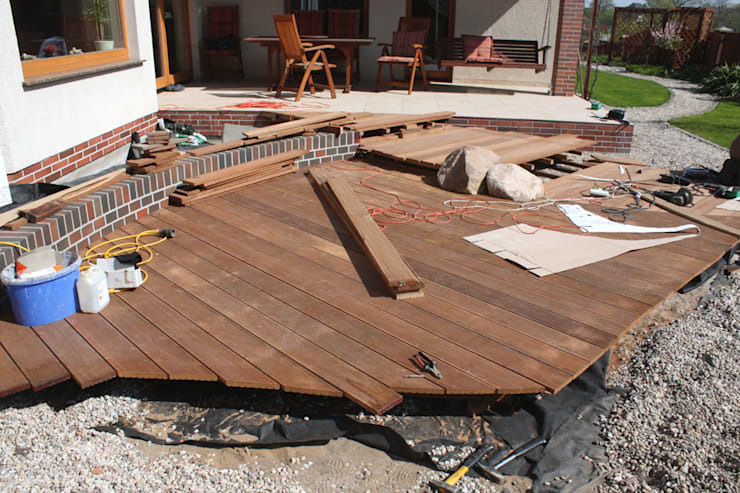 If you've got a beautiful outdoor space perfect for a deck, why not get out there this weekend and build one yourself… you might be surprised at how easy the woodworking element actually is. 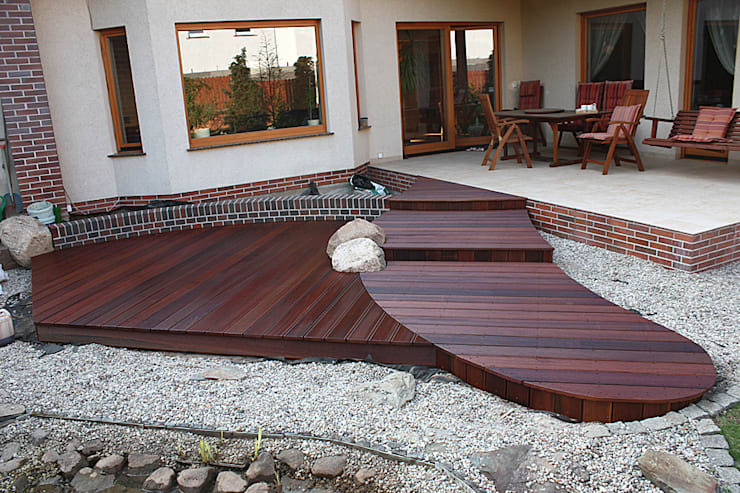 We are, of course, referring to a deck – that delightful touch that can beautify a home while also providing a comfortable outside spot for relaxation. To inspire you (and treat you to some visual beauty), we’ve selected three examples of wooden decks that have severely enhanced their relevant properties’ looks and value – and we’re going to be taking a step-by-step look at how they were constructed. 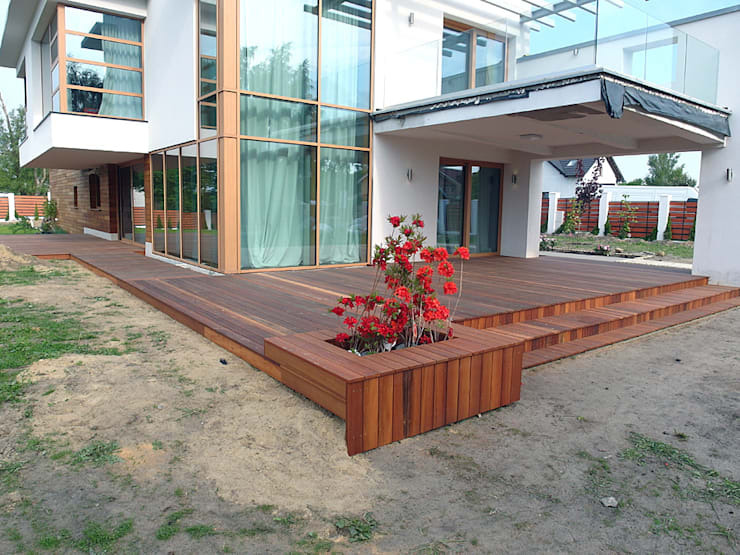 This is what one strives for when deciding to build a wooden deck: a spacious outside floor that can conjure up a range of activities, from lounging in the sun to enjoying an al fresco meal with family and friends. 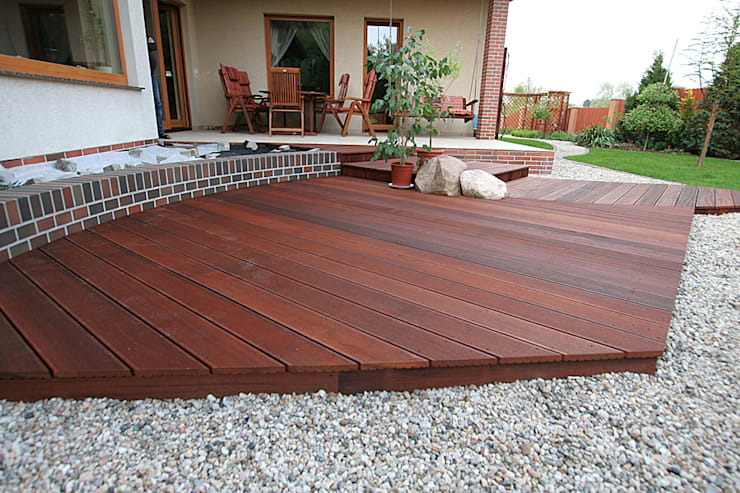 However, it is important to pick a surface material that’s able to withstand the elements: humidity, moisture, extreme temperatures – they are very much real, and they don’t care how much you love your little deck. 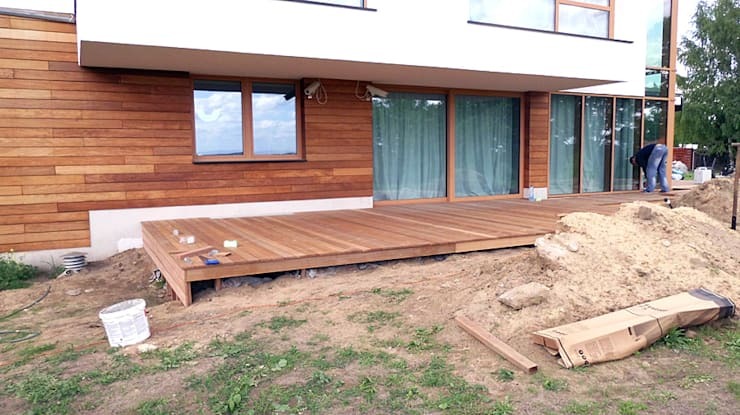 This particular terrace opted for wood as the main surface, which, of course, has been treated to sufficient coating in order to protect the timber. 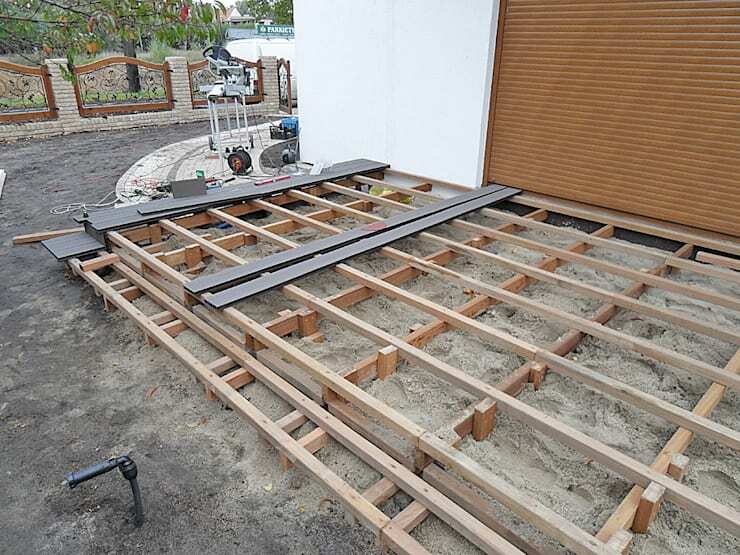 But every great design has to start somewhere, so here we see the foundation for the stunning deck being laid – timber panels forming the skeleton, with sand added to ensure the wood remains fixed and secure. With the foundation firmly in place (and nailed tight, obviously), the top portion of the deck comes into effect via the wooden panels. With all the required planks nailed into place, the surrounding lawn areas and brick path were always treated to touch ups to ensure a striking (and most welcoming) result. For our second example, we present a very different layout and look of a terrace. 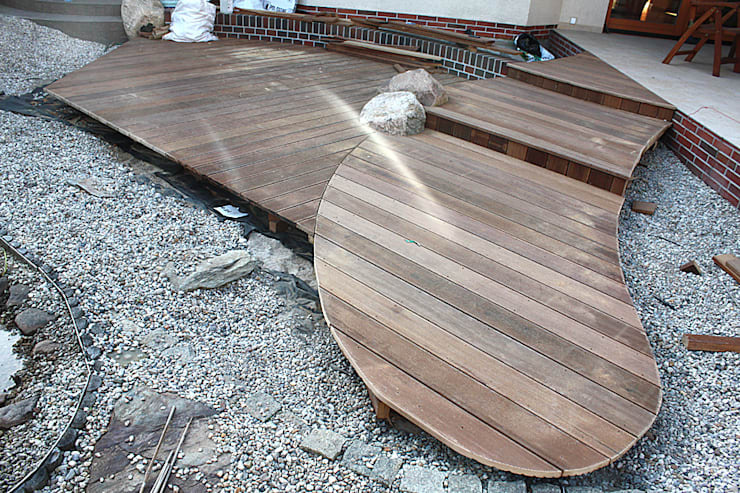 Although this deck is also clad with wooden planks, it definitely portrays a very different look than the previous example. Let’s see how it came together. 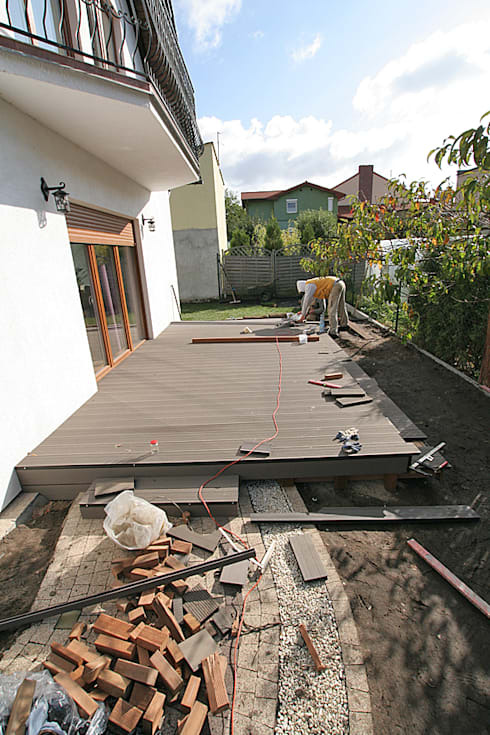 After cleaning the ground surface where the deck is supposed to be, a gravel foundation is laid to prevent grass from growing through the deck. 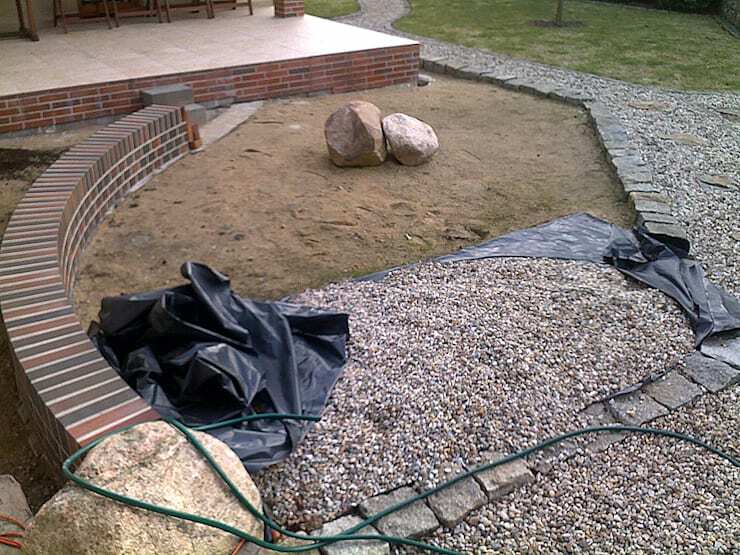 The gravel also marks the outline of how the deck will appear. 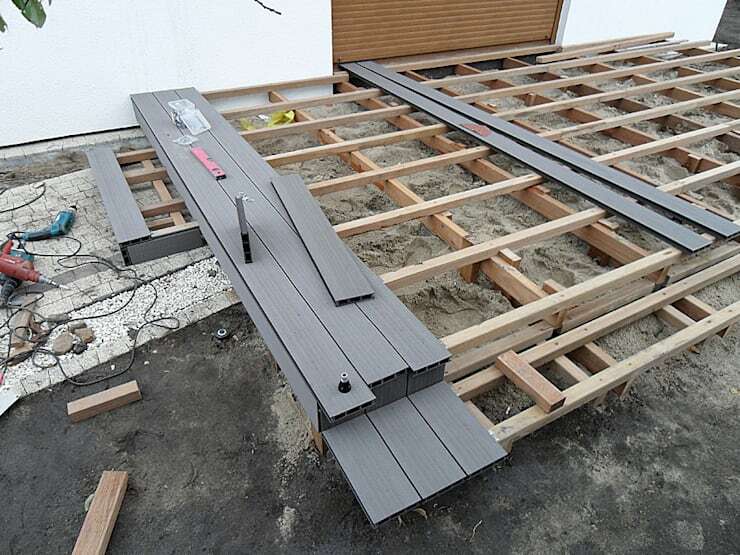 Just like our previous example, a skeleton structure of wooden panels is laid on top of the main foundation, on which the final wooden planks for the terrace/deck will be placed. Notice that the beams are not spaced out too far from each other in order to ensure a strong level of support for the deck. The very last level of wooden planks is laid. Notice that these are not 100% shaped yet, as they will still be cut and edited afterwards to form the desired structure. All irregularities are cut / grinded away to ensure a curvy and smooth form for the deck. Seeing as we’re working with wood once again, the appropriate measures in terms of protective coating need to be taken. Afterwards, the desired colour can be added, which in this case turns out to be a rich brown tone with patches of warm red mixed into it. Now for the fun part – adding in the design touches, such as the potted plants and additional garden features. Isn’t this just the most sublime way to spruce up a front entrance to a house? Of course if your deck is big enough, you can use it for an entertainment/socialising area, complete with furniture and the necessary décor pieces, just like our third example will turn out to be. And notice the exquisite touch in the front with the wooden planks forming a unique, built-in space for a potted plant. 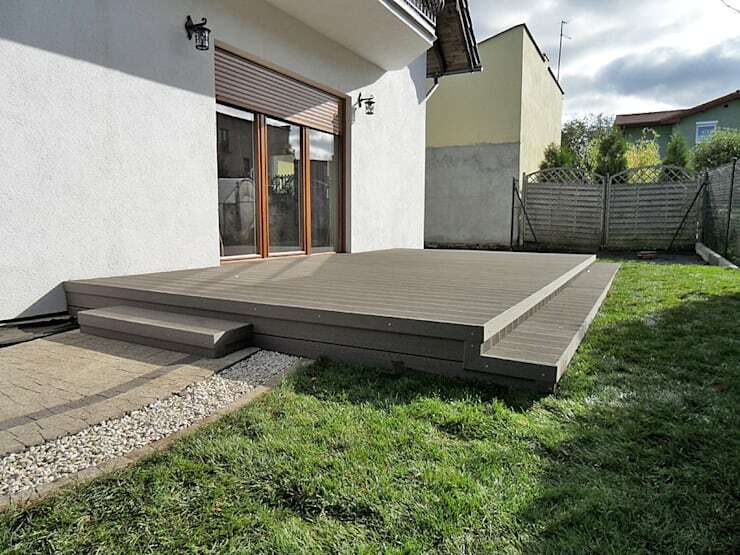 Because the ground was quite uneven, the terrace deck had to be slightly raised in order to provide a level surface, as well as decent access to the house. 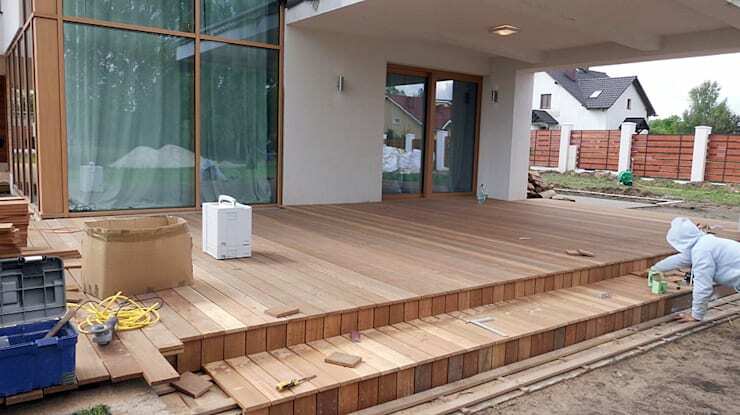 As the house’s landscape is not level at all, but the deck is supposed to be one consistent surface, it means that the one side of the terrace had to get a step or two for easy access. After this was completed, the practical touches could be applied, such as the protective coating, appropriate polishing and desired colour. 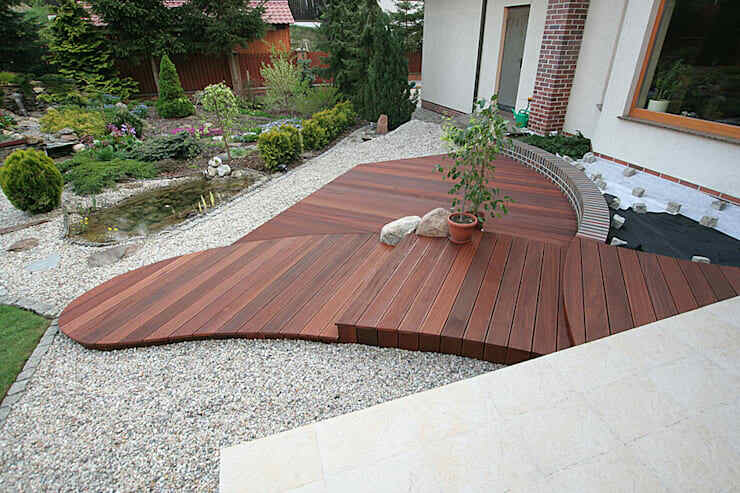 And there we go: a chic wooden deck that neatly wraps around the house and is big enough to provide a stylish outdoor living area (beautifully sheltered by the top-floor balcony). Want even more inspiration? 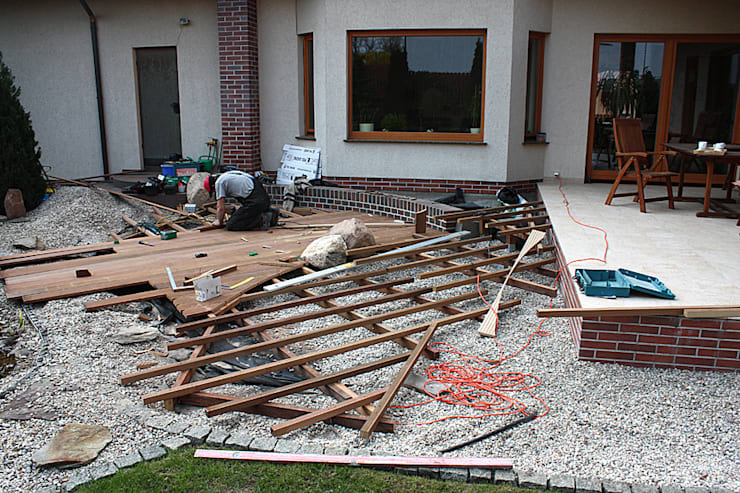 Then see how: This family turn their wasted garden into classy decking.